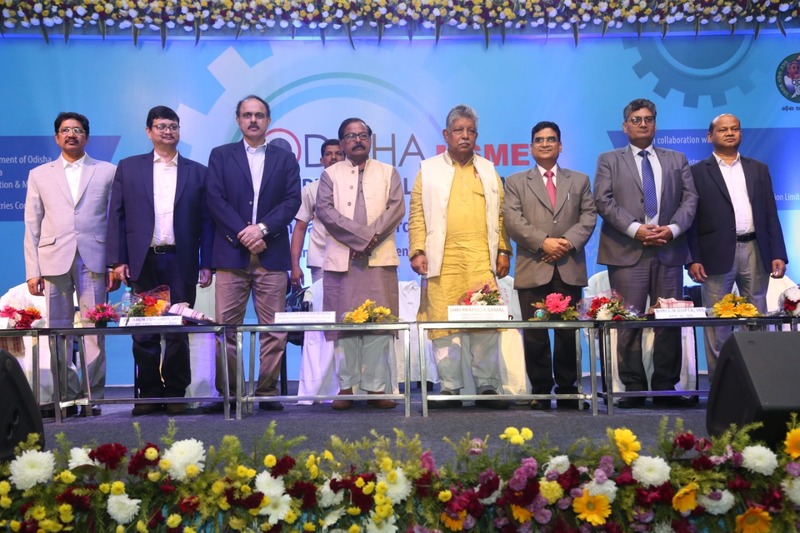 Promotion and growth of MSMEs has been the top most priority of the Government, said Hon’ble Finance, Excise & Agriculture & FE Minister Shri Sashi Bhusan Behera while inaugurating the International MSME Trade Fair, 2019. He was delighted to note that more than 400 MSMEs and 40 Start-ups are participating in the Trade Fair. Besides 32 entrepreneurs from 04 countries namely Iran, Bangladesh, South Korea and Cambodia are participating in the Trade Fair. He welcomed them all to explore business opportunities in Odisha. Sh. Behera stated that more than 3.67 lakh MSM enterprises have been established in the state with a cumulative investment of more than Rs.17,863 crore. They are providing employment to over 14.61 lakh persons. He added that investment promotion in the MSME sector remains a focus area of the government and informed that altogether 724 projects worth Rs.2765 crore have been approved by District Level Single Window Committees since April, 2015. He wished all the international participants, industry associations, entrepreneurs and startups all the very best for their business promotion and entrepreneurial endeavours. Speaking on this occasion, Sh. Prafulla Samal, Minister MSME, W&CD, MS and SSEPD stated that development of MSMEs and provision of a conducive eco-system for their development remains our focus. Not only through the newly declared policies for MSME and Food Processing Sectors, but also with the help of credit mobilisation to MSMEs, Govt. is assisting the entrepreneurs. Speaking on the occasion Dr. Arun Kumar Panda, Secretary, MSME, GoI congratulated the state government for organizing the Odisha MSME International Trade Fair and taking steps for growth of MSMEs in the state. He assured to extend all cooperation for the growth of MSMEs of Odisha through cluster funding, ZED, GeM and Digital Marketing. He stated that we need to increase finance in MSME sector for producing more job givers than job seekers. Shri L.N. Gupta, ACS, MSME stated that the theme of this trade fair is “Innovation, Entrepreneurship and Startups”. The Startup Odisha Initiative acquired the momentum with the launch of Startup Odisha Portal (www.startupodisha.gov.in) by the Hon’ble C.M in May, 2017. In the journey of last 20 months, 350 startups working across the sectors are registered under the Startup Odisha Initiative. So far 61 financial assistance have been extended under the Startup Odisha Policy. 11 Incubators and 12 Nodal Agencies are working to assist the startups besides a network of 110 mentors. Recently, DIPP, Govt. of India has recognised Odisha as “Top Performer” in the States Startup Ranking-2018 for developing a strong start up ecosystem. With addition of 20 startups per month, we are on our way to achieve the government’s mission of 1000 Startups by the end of 2020. Govt. is committed to promote innovation and startups throughout the state. On this occasion, Sri Sudhir Garg, CMD, NSIC & J.S, MSME, Govt. Of India informed that MSME are the backbone of the economy. NSIC is constantly making efforts to boost the MSME sector in the State and is helping in MSME credit facilitation, marketing support to MSMEs. Besides NSIC is also providing raw materials and technology support to the MSMEs of the State. He also encouraged the MSMEs to take advantage of the opportunities offered by the State in this platform. Business delegation from Taiwan proposed to set up petroleum cracker plant in Paradip with an investment of Rs 43,000 crore Sprawling in 3 Acres of land at IDCO Knowledge Zone Gothapatna STPI ELITE is a mix of both modern and traditional architectural design to house STPI’s Next Generation Incubation facility Kurl-on Rs 1 billion Odisha plant to go on stream in December-end Amazon has approached Odisha government to set up one of the biggest warehouses in the state.